A lot of bikers don't really understand the implications of Wilderness, and the threat to mountain biking. Several Wilderness Bills are being proposed in California this year, led by Barbara Boxer, and would shut down thousands of acres to mountain bikes. 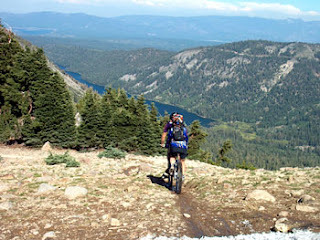 Here is a quick article from the IMBA website below: Bicycling and Wilderness: A Mountain Biker's Guide to Wilderness Advocacy. 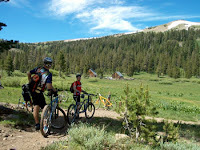 "Wilderness often presents a dilemma to the environmentally conscious mountain biker. While most of us applaud the intentions of the Wilderness Act, we also believe that bicycles are an appropriate, muscle-powered activity that belongs in Wilderness alongside hiking and horseback riding. But why did bicycles ever become embroiled in the Wilderness debate? 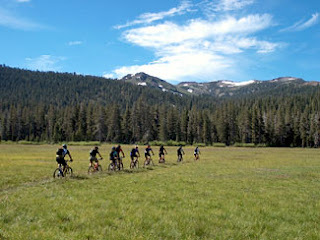 Note that bicycling is not mentioned in the Wilderness Act. The key provision often debated is in Section 4(b), which prohibits in Wilderness all motorized travel and equipment and allows "no other form of mechanical transport." What does the term "mechanical transport" mean? In 1965, shortly after the Congressional action, the Forest Service wrote formal regulations to implement the Wilderness Act and defined "mechanical transport" to mean a cart, sled or other wheeled vehicle that is "powered by a non-living power source." As of the year 2005, that definition is still law. However, nineteen years after the passage of the Wilderness Act, during the early days of mountain bicycling, the agency added a regulation that prohibits "Possessing or using a hang glider or bicycle." That 1984 action was one of the first to ban bicycling on public lands and by eliminating riding on approximately 25 million acres, it was also certainly the largest. Unfortunately, most Americans are not aware that bicycles are banned from Wilderness. This can create the impression that bicycles cause more harm to the environment than do hikers or horses. In fact, science has shown that bicycles generally cause about the same amount of damage as hikers and less damage than horses. IMBA has summarized the findings of this research, available at: imba.com/resources/science/impact_summary.html. When the topic of bicycles and Wilderness is debated by the conservation community, views are often split. The Spring 2003 edition of Wild Earth, a biodiversity and conservation publication of the Wildlands Project, invited six environmental advocates to weigh in on the issue. You can get a sense for both sides of the argument and those on the fence." Pictures above (top to bottom) are from the IMBA website, of the Meiss Meadow Trail near Tahoe, Mt Lola trail in Castle Peak, and the Tahoe Rim Trail...all threatened by Wilderness designations.